A very important part of owning a ferret is having a ferret cage. Even if you plan to allow your ferret the run of the house, it is advisable to purchase cage. Although ferrets love to roam, later training is easier in a ferret cage, in your little pet will be safer in a cage when you were out of the house or a sleep. Some of the best ferret cages are by Ferret Nation. 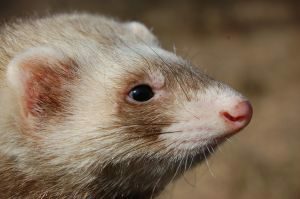 The dimensions of a ferret cage should be no less than 36 x 24 x 18″ to house one or two ferrets; if there are more than two ferrets in the same ferret cage, it should be proportionally larger. Wire is recommended because it is easy to clean and does not absorb odors. Plasticware Iams or plastic cages should not be used, as they do not provide enough ventilation. However, be sure the floor is covered with soft toweling or indoor/outdoor (washable) carpet to prevent their feet from damage by the wire. Be sure the wired grids are close enough to gather so the ferret does not escape. There should be no sharp wires exposed on ferret cages. One very good type of ferret cages is the two-story”style with a ramp of connecting the two levels. On the bottom level the letter can and food can be stored, leaving enough room for the ferret. The top level is also for the ferret to roam, and they have great fun going up and down the ramp. Always provide lots of clean towels for the ferrets to curl up in at nap time in their ferret cage. The litter pan should be of plastic with sides low enough for the ferret to get in and out easily. A good grade of cat litter(not newspaper or cedar shavings) should feel the pan of about one-quarter full. amiliar food. The mess that ferrets can live outdoors, but they are so small it really is no problem keeping them inside. 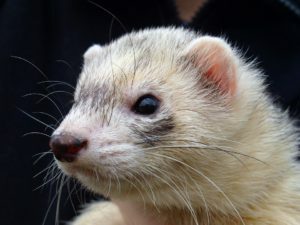 Indoor ferrets or more affectionate and human orientated if kept with their owners. If you don’t keep your ferrets in a ferret cage you’ll miss much of their adorable antics and they will be less of a pet if they are kept outdoors. It is a good idea to buy a ferret cage for safety and training purposes. Remember, ferrets are so small that a cage seems like quite a bit of room to them. However, be sure they have several hours of freedom daily for play, human companionship, and exercise. Ferrets cannot with stand between us and temperature. They suffered greatly if the temperature is much above 80. Never put ferret cages in a draft or where direct sun is shining on them. Even if the room temperature is comfortable, the direct sun will keep them up. Also, be sure the ferret cage is not receiving a blast from the heating or air conditioning duct. The best betting is soft towels. So they can cuddle up in them. Some ferrets will chew up the towels, if your ferret does, watch them closely to see if he becomes ill. Ferrets love to hide to sleep, so let them disappear in their bedding for a snooze. A ferret cage should be cleaned weekly using water and mild detergent. Scrub, rents, and cover services with a disinfectant. Leave the disinfectant on for 10 minutes, then rinse well. The bedding should be changed weekly-more often if there has been an accident. Food bowls should be emptied of on eating food daily, wiped clean, and refilled. Wash bowls in dish detergent at least every week. Don’t fill the food bowl completely, because some ferrets will not eat stale food. Water bottles in your ferret’s cage should be emptied, cleaned up with dish detergent, thoroughly rinsed, and refilled daily. A soft toothbrush or bottle brush is good for cleaning inside. Be sure to clean the rubber stopper and shrinking to. The key to having a happy and healthy ferret is keeping the ferret cage clean.